We are a different breed of CPA firm, leveraging advanced technology and email-free online request tools. Top-tier service with highly experienced, industry specialized professionals that provide a pain-free, streamlined audit process at unbeatable values. Our former Big-4 professionals offer trusted experience with prompt, efficient audits. 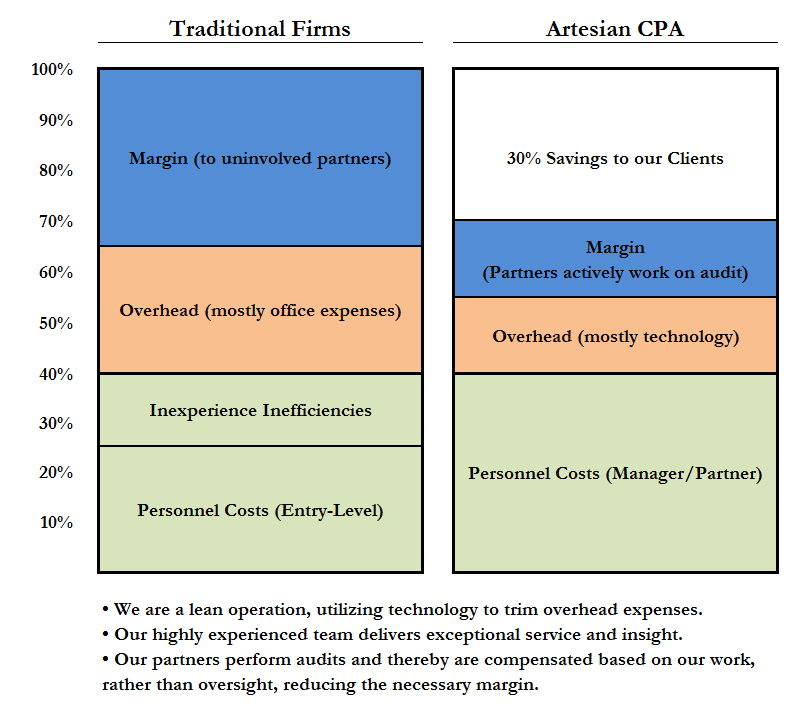 Artesian CPA is a leading firm specializing in Regulation A+ audits and other crowdfund offerings available under the new JOBS Act securities regulations. With over a dozen Regulation A+ audit clients, we stand to become the most knowledgeable and experienced firm in dealing with its unique requirements, which provides tremendous value to our clients in the SEC review process. We regularly speak on crowdfunding and Regulation A+ at major industry conferences including the recent invite-only CrowdfundingUSA Forum, panelist at RealCap Real Estate Crowdfunding Conference, panelist and workshop leader at the upcoming Regulation A+ Master Bootcamp in Las Vegas, panelist at the upcoming Crowdfunding Professional Association Annual Summit, nationally published on the topic by industry publications, and twice quoted and profiled regarding Regulation A+ offerings by Entrepreneur Magazine. Our industry knowledge, SEC reporting experience, and industry connections set us apart as the industry leader for Regulation A+ accounting, auditing, and SEC reporting matters. Nationwide presence with licensing or permits for audits in 24 states covering over 70% of the US population and GDP. Better: Highest quality reports and answers for all your questions. We know your industry. Faster: We have designed our system and approach to facilitate the quickest turnaround. Partner-level professionals perform your work - we can turn reports around without delay. Easier: You will only work with partner-level personnel, highly experienced and able to solve your problems, not create them. We utilize top-tier technology to ease the administrative burdens. Best Value: Our technology and top-down approach allow us to complete audits in a fraction of the time they take our competitors. This translates to significant savings to our clients. We typically provide a 30% fee reduction.